An exceptionally stylish and comfortable stool, the luxury Deluxe High Back Bar Stool in cream makes for a superb item of furniture. Ideal for use around the home, in a kitchen or breakfast bar, the Deluxe High Back has a simple design that matches well with any surrounding decor, modern or traditional, and adds a bit of chic and class to the mix. The large, accommodating seat is made from soft foam padding with cream faux leather stitched over it. A tall concave backrest gives excellent support for the entire back and makes this stool amazingly relaxing. 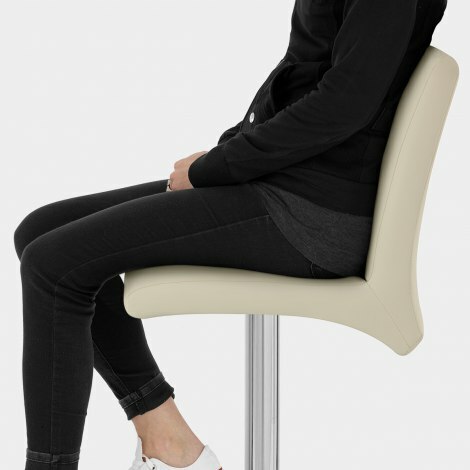 A variable height gas lift and 360-degree swivel mechanism bring function and fashion together, allowing the stool to rise, lower, and rotate around, giving much needed dynamics. Holding the seat aloft is the slender chromed stem, upon which is a unique feature to this stool; the curved T bar footrest. Hand crafted from chrome plated tubular steel, this footrest provides a perfect location to place your feet, again adding to the overall comfort and desirability. A strong, sturdy circular base keeps the Deluxe High Back stool stable, and also has a rubber ring beneath to help keep your floor free from scuffs and scratches. "Good quality chairs, easy to assemble"
I ordered two of the Deluxe High Back Stools and I am very pleased with them. They arrived well packed and were easy to assemble. The delivery was excellent. They arrived the day after ordering (I did not order until mid afternoon) and the delivery was free. Unlike other companies who wanted to charge exorbitant delivery charges. Would not hesitate to shop with Atlantic again or to recommend to friends. We bought four of these for our London flat and we’re very happy with the quality and the high back means they are very comfortable. Great price too. Lovely stylish stools. Easy to assemble and super comfortable. Next day free delivery. Couldn’t be happier! Bought 2 Barstools, good quality, easy to assemble. Would definitely buy again. Ordered 5 of these stools. Wanted a slightly higher backrest and these chairs fit the bill perfectly. Look great, great quality and great service from Atlantic.